Time: approximately 2-3 hours, but if its not going well-take a break and come back later. Who cares how long it takes you? If you wanted it done quickly you would have paid a shop who would have kept your bike for at least a day. 13. 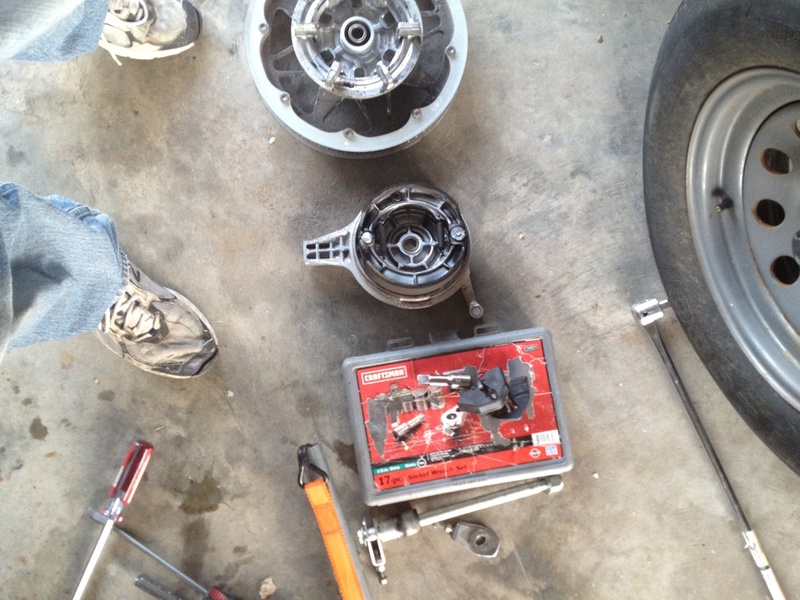 Remove drive belt sprocket from left side of wheel and set aside until you reassemble later. Note: removing the black rubber bumpers is optional. Each is simply pushed into place with a rubber pin underneath slotting into a matching hole in the wheel. 14. Remove brake from right side of wheel and set aside until you reassemble later. Note: you might as well also inspect brake linings for depth now. 19. 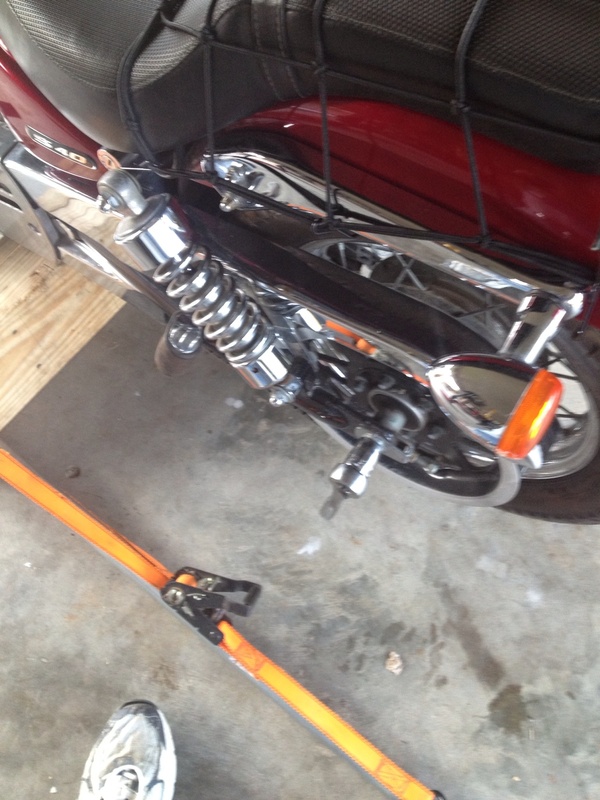 Use 2 tire irons (and door edge protectors to protect the finish on your rim) to work one edge off of the rim. Use your hands as much as you can and use tire irons sparingly and only at the end. Less tire iron means fewer rim scratches. 21. 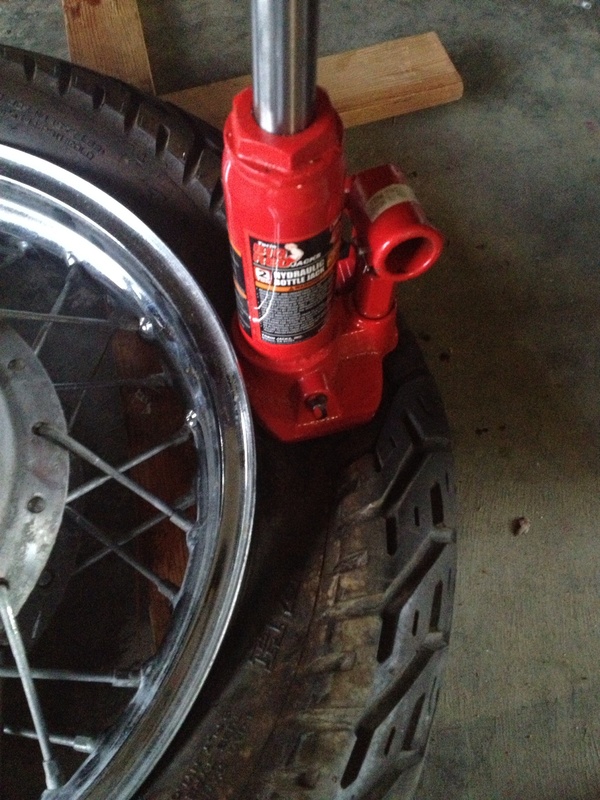 Remove any nuts on valve stem and push valve stem into wheel. 31. 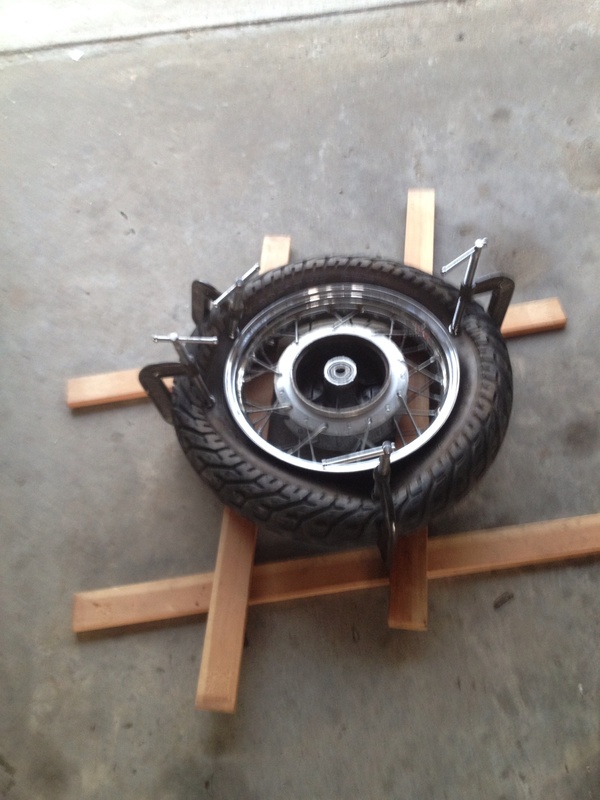 Install one edge on wheel using hands until the end and only then use tire irons and door protectors. If it takes a while, use more lubricant. 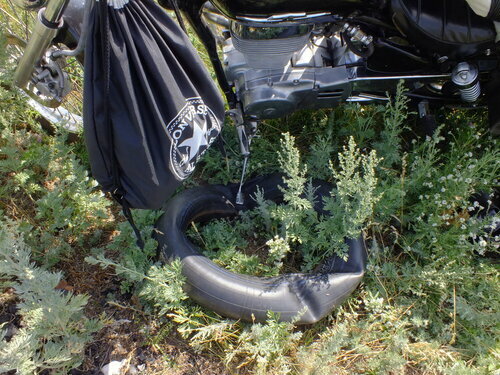 Note: a great idea on a sunny day is to put the tire in something like a black trash bag to heat it up before you use it. 32. Take new tube, air it up to barely inflated-just get wrinkles out. Rub outside with talcum powder. Remove air by removing valve. 33. Hang tire over handle bar with valve up. Insert 2 ounces dyna bead using application kit. 34. Reinstall valve and this time put in just enough air that the tube is semi flat. There should only be enough air to keep tube from being twisted on itself during installation. 36. Check directional arrow and now look for a yellow or other colored dot. This marks the lightest part of the tire and the tire should be rotated to place this dot next to the valve hole, as the valve and nuts will add extra weight for balancing. 37. Push tube deep and away from wheel rim where you will be using irons. 38. Install remaining edge on wheel using hands until the end and only then use tire irons and door protectors. If it takes a while, use more lubricant. Periodically check on tube to be sure you are not pinching it. Note: I like to work the rim up from the valve to the side opposite the valve, where I use irons. 39. Once both rims are on, fill tire to 30 pounds and watch tire bead seat against the rim. 45. Reinstall bushing L and R. You can hold the right side parts together with the axle and the left side parts with your long extra bolt or a large screwdriver. 47. With everything aligned, grease the axle and use a rubber mallet to tap axle in place while backing out screwdriver or long bolt. 50. Adjust right side tensioner to same position as left, but this is not the final position. 51. 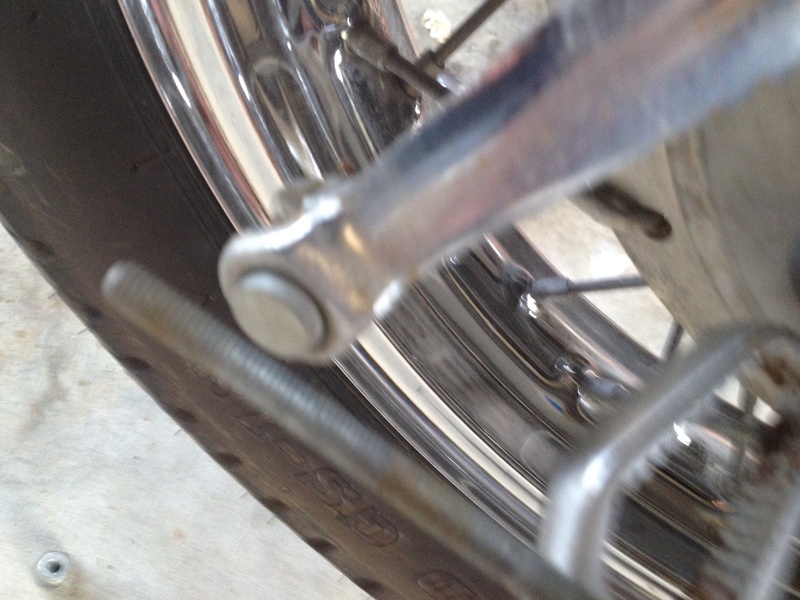 Using beam compass, check distance center to center from chrome swing arm cap to axle. 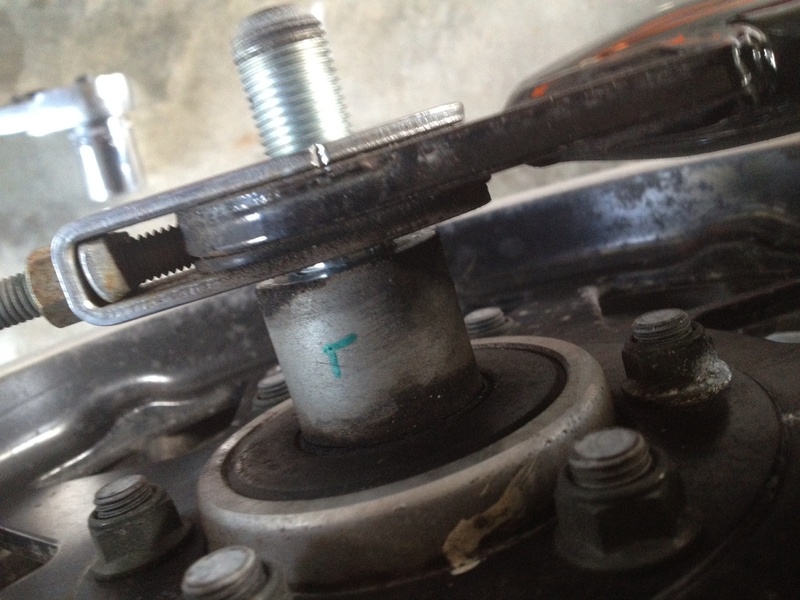 Adjust right side tensioner to the same center to center position, ignore frame markings. When both sides of axle centers are the exact same distance from the center of the swing arm, then the axle is square. 52. Tighten down axle nut, you need to have a wrench on the right side of axle to accomplish this. Recheck belt drive tension. 54. Recheck air in tire to 29 pounds solo riding, 33 pounds for 2 up riding. Wooden frame to protect rim while working. C-clamps do not work as well as bottle jack. rss, when I use C-clamps, I use a couple of 1"x4"x4" scraps of wood to make them more effective. This last time I had a couple of pieces of 1/4"x2" steel flatstock handy so I used them. I have also heard that carpenter clamps with their wooden blocks work well, but for me the bottle jack is hard to beat. Just a little heads up on this tire. I had 712's mounted front and rear a couple of weeks ago for Inspection. The rear sidewalls are about 14mm taller than the stock tire, and if you have bag supports mounted as I do, the mounting bolt and nut WILL contact the tire on large whoops. The tire hits on the very outer edge of the tread, at the shoulder. I've been taking it easy breaking them in, so I haven't been grinding the hell out of them. It has stopped me from taking my lady on rides till it's squared away though. She's not too happy. I have the shocks set on the stiffest pre-load setting since I weigh 260#. Looks like I'll have to either grind down the hardware, or remove the supports for now. I really like these tires so far. We have a lot of country roads that have longitudinal grooves (Not rain grooves, But wavy grooves from the tar and chip coatings they lay down here in PA.) that made the old front tire nibble back and forth pretty badly, These Shinkos are excellent on those roads and track well. They're also pretty quiet and smooth riding. you can use a BIG friend, putting it on the tire and that he jumped on it. and after install the patch on the tube, it is possible to press it this a few minutes..